“Prayer as Crucible” is the name of a chapter by Sarah Coakley in a book entitled How My Mind Has Changed: Essays from the Christian Century. 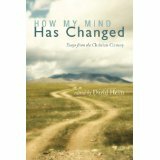 The book was edited by David Heim, executive editor of Christian Century. Sarah Coakley is a professor of divinity at the University of Cambridge and a priest in the Church of England. Almost anything about prayer catches my eye these days because in about two months my novel on the subject will be published by an independent publisher. Coakley describes her essay as “an account of how prayer—especially the simple prayer of relative silence or stillness—has the power to change one’s perception of the theological task.” There’s something to roll around in your mind! I agree with her understanding of the prayer of silence because this was my experience too. Like Coakley, I came to a quite deepened relationship with the divine through the practice of Transcendental Meditation (TM). She calls her TM experience an “experiment.” Mine, which started in 1992 and has continued since, was more deliberate but the results have been similar. She writes, “the impact was electrifying.” I usually understate it as “the single most important thing I’ve ever done.” But I like her words that the prayer of silence has the power to change one’s perception of the theological task. Of course this begs the asking of what the theological task is. If theology literally means “study of God” and is understood as meaning the study of the nature of God and religious belief, then the change in my perception that came about through TM was the realization that what I most wanted (to feel close to God) is not only possible but a gift God wants for me to have. Therefore, the theological task, as I see it, is falling into relationship with God. Sitting in silence as a regular practice is the ticket.